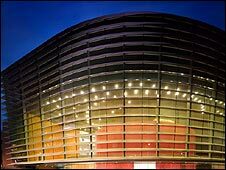 The cost of building Leicester's Curve theatre did not represent good value for money, according to an Audit Commission investigation. The project was scrutinised after it went almost £35m over budget. When the theatre plan was unveiled in 2000, it had a budget of £26m with the city directly paying £4.4m. But changing designs and rising costs more than doubled the overall price tag to £61m. The council said the project had delivered a world-class venue. The Audit Commission report criticised work being started before the final design had been approved, resulting in changes being made while the building was ongoing. It also highlighted "weak project management arrangements at the start of the project". The report said: "The detailed operation of the innovative building was insufficiently considered at the design stage. "The council commissioned a number of reports to review its management of the project and the rising costs and to learn lessons, but it is not clear that all recommendations have been fully implemented." Councillor Andy Connelly, cabinet member for culture at Leicester City Council, said lessons have been learnt. "We accept the recommendations made by the commission but their report was carried out when Curve had only been open less than four months - it was too early to judge whether it's value for money," he said. "It's a brand new concept, it's not a traditional theatre building...we didn't fully realise what the cost of building one of an original design would be. "It's a great asset and a catalyst for the regeneration of the city. It will be a great success." Curve was designed to replace the Haymarket theatre, which had struggled with financial problems for several years. It hosted its first performances at the end of 2008. It has two auditoriums, one seating 750 people, the other 350, which can be combined into one theatre space.